Fantastic beasts who have hidden for the winter now emerge, triumphant in the struggle against the Lady of the Woods. We know very well that you have been waiting with bated breath to find out what the new (Our 6th) season will hold. Your deluge of emails, phone calls and letters have encouraged us to proceed with this; our 6th season! There, we said it again! There!!! We got that big job done! We want to take this opportunity to Thank You for your support and your enjoyment of The Arts and The Red Horse Gallery for these last 6 (yes! 6) years Each and every Artist that The Gallery has shown is so Happy when you show (ha!) up for an Opening Reception. Please continue to visit and enjoy what we have on offer! 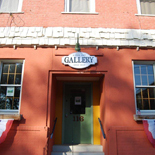 The Red Horse Gallery in Beautiful Downtown Fountain City! This entry was posted on March 29, 2017 by Nicholas Sagan.